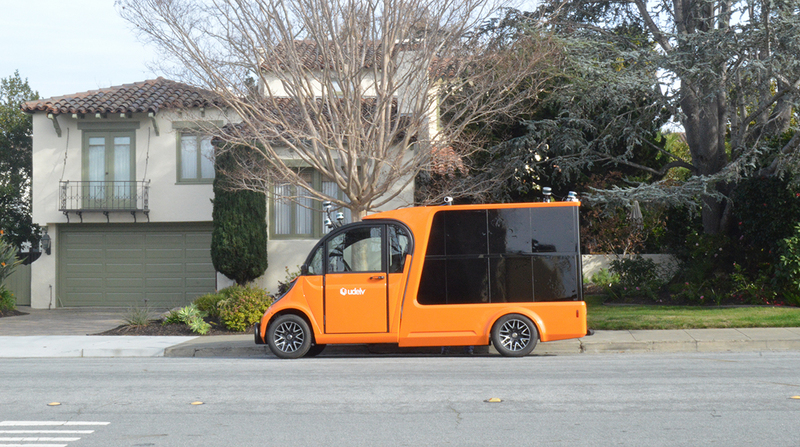 An autonomous vehicle designed for last-mile deliveries and e-commerce returns conducted a live test Jan. 30 on public roads in San Mateo, Calif., driving a 2.5 mile loop from a grocery store to two customers. The electric-powered Udelv vehicle obeyed traffic lights, lane changes, left turns and the two stops, according to the Burlingame, Calif.-based company. There was a human driver in the vehicle as required by state law. The vehicle is controlled remotely to allow for human-assisted guidance. The Udelv can carry up to 700 pounds of cargo in its 18 secure compartments. Customers that order a delivery must go to the curb to meet the Udelv vehicle, and use an app to open the cargo door with their smartphone. The company has said it will initially focus on deliveries. It also plans to be in the package return business, a rising need for e-commerce merchants, as consumers shift to online purchases. Some e-commerce product categories have returns up to 30% compared with 11% for the entire retail sector. Removing the driver reduces costs but requires the customer to go to and interact with the vehicle. Udelv CEO Daniel Laury told Transport Topics that the firm has received interest from delivery firms, shippers and retailers. The Udelv is built on a Polaris Gem electric vehicle commonly seen on campuses as a shuttle or small utility vehicle. It has a range of 60 miles. The driverless technology includes eight cameras and six lidar sensors from Velodyne.